This is a recipe for an eggless Chocolate Cake with a Chocolate Ganache Frosting. 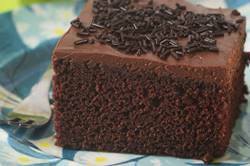 It is a single layer cake with a rich chocolate flavor and a moist and tender crumb. A delicious snacking cake. The kids will love it with a tall glass of cold milk while the adults might prefer it with a hot cup of coffee or tea. What makes this Chocolate Cake unique is that it is a "mix-in-the-pan" type of cake. Which means you can just mix all the ingredients together, right in the cake pan. A little unusual which is probably why other names for this cake are a "Wacky" or a "Crazy" Cake. However, while in theory I like the thought of no dirty dishes, I will say that, practically speaking, I find it much easier to mix the ingredients together in a separate bowl, rather than in the square baking pan. There are a couple of things about this recipe that are worth mentioning. First, as I said above, it does not contain eggs. Second, this cake uses unsweetened cocoa powder (can use either natural unsweetened or Dutch processed) which gives the cake a deep chocolate flavor. Third, we also add a little lemon juice (or vinegar) to the batter. Now, if you use natural unsweetened cocoa powder there will be a reaction between the unsweetened cocoa powder and the lemon juice which gives the baked cake a distinctly red tinge (reminiscent of a Red Velvet Cake). And lastly, while I have used melted butter, you could substitute with corn, canola, safflower, or even a vegetable oil. Once the cake has been baked and cooled, I like to frost it with Chocolate Ganache. But this is not absolutely necessary. If you like you can just dust the top of the cake with a little powdered sugar or cocoa powder and serve it on its own or with whipped cream or a scoop of ice cream. Now, Chocolate Ganache is a rich and smooth mixture of semi sweet or bittersweet chocolate and heavy whipping cream. While it is often poured over a cake for a smooth and shiny glaze, for this recipe we are letting it cool until it becomes a thick and spreadable frosting. Chocolate Cake: Preheat your oven to 350 degrees F (180 degrees C) and place the oven rack in the center of the oven. Butter or spray an 8 inch (20 cm) square baking pan with a non stick cooking spray. Line the bottom of the pan with parchment paper. In a large bowl whisk or stir together the flour, sugar, cocoa powder, baking powder, baking soda, and salt. Add the melted butter, water, lemon juice, vanilla extract, and coffee extract (if using). Mix all the ingredients together until well blended. Pour the batter into your pan and bake in preheated oven for about 28 - 30 minutes, or until the cake springs back when lightly pressed and a toothpick inserted in the center of the cake comes out clean. Remove from oven and place on a wire rack to cool for about 10 - 15 minutes before removing the cake from the pan. Chocolate Ganache: Place the chocolate in a medium sized stainless steel, or heatproof bowl. Set aside. Heat the cream and butter in a medium sized saucepan over medium heat (can also be heated in the microwave). Bring just to a boil. Immediately pour the cream over the chocolate and allow to stand for a few minutes. Stir until smooth, then let stand at room temperature until the Ganache has completely cooled and set to spreading consistency. Spread the Ganache on the top and sides of the cake.